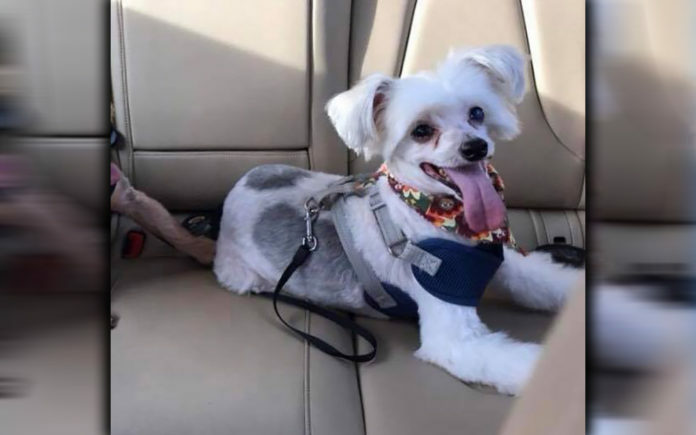 In 2009, my cousin Shannan McAfee Smith and her husband Gary Smith received a phone call from Precious Paws Asian and Small Breed Rescue about a Powder Puff Chinese Crested dog they rescued from a raid on a Tennessee puppy mill. Ardent dog lovers, the Smiths had adopted another dog from this organization, a Chinese Crested named Winston. The couple was shocked to learn about the conditions in the puppy mill where small wire crates confined the dogs stacked up four deep on top of each other. Many of the dogs were in bad physical condition, and sadly there were deceased decomposing dogs in some of the cages. At the time of his rescue, one of Charlie’s legs was caught in the cage bars as he may have struggled during his confinement. They had to cut the apart cage in order to free him. His leg was shattered, and the rescue organization provided needed surgery. Charlie’s leg was saved, but he had a steel rod that remained inside. His leg never healed sufficiently for him to do certain things such as going down stairs. The Smiths did not hesitate. They had always rescued abandoned and shelter dogs. Soon they were on the road making the 5 hour trip from their South Carolina home to foster the little one-year-old dog. Charlie had many milestones, like the time he first happily wagged his tail. Eventually Charlie discovered toys, and he would greet the Smiths at the door with a different toy every evening. However, Charlie never permitted belly rubs. For reasons they could only speculate, he remained protective of his belly and underside. On August 6, 2018, Shannan and Gary arrived home to discover Charlie lying behind the couch. One of their other dogs cried out, sounding the alarm that something was seriously wrong. The couple rushed their beloved little Charlie to the vet, only to have him pass away in their arms the moment they entered the clinic. Their vet speculated that 10-year-old Charlie, previously diagnosed with a mild heart murmur, may have suffered a stroke or heart attack. The Smiths were distraught. Charlie had shown no symptoms of illness when they left home that morning. People need to realize that when they buy a puppy from a pet store or over the Internet, the parent dogs have endured years of suffering in puppy mills. These puppy mills are “factory farms” where hundreds of dogs live confined in small cages in deplorable conditions, suffering in extreme weather, never feeling the soft grass beneath their feet, and never receiving a loving touch. Think about the joy Charlie gave his humans, and visit a shelter or rescue group when you seek a new dog. Coachella Valley residents can contact Loving All Animals at www.lovingallanimals.org or (760) 834-7000. To find a wonderful rescue dog nationwide, check www.petfinder.com.